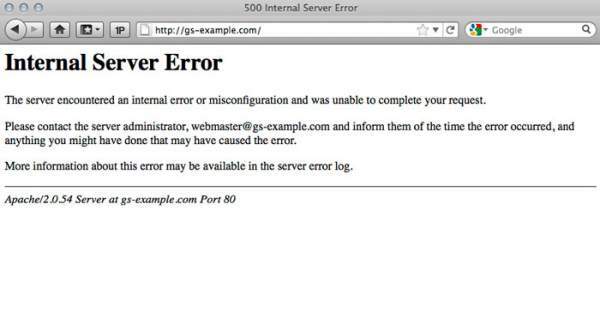 How To Fix 500 Internal Server Error: What is HTTP Error 500 and Solutions? 500 Internal Server Error (HTTP Error 500): One of the most common messages we see around while surfing the net is 500 Internal Server Errors. It is a general HTTP status code that means something is wrong with the server of the website, though what is the exact cause is not known. So, it’s a kind of error which encompasses a long list of possible reasons within itself. Website developers have got the freedom enough to showcase this error in any way possible, provided that they do show the number 500 with the preferred message. 2 Cause/Reason: Why 500 Internal Server Error (HTTP Error 500) occurs? 4 How to Solve the 500 Internal Server Error? So you might find this (HTTP 500 Error) in following avatars possible. A 405 Method Not Allowed error is one more way this error is reported by the website owners. Sometimes Google services like Gmail and Google+ also face the same kind of errors. Often, they report a Temporary Error (500) or simply 500. We also come across during Windows Update. It also reports an Internal Server Error as a WU_E_PT_HTTP_STATUS_SERVER_ERROR message or as the 0x8024401F error code. Here, it is to be noted that this particular thing doesn’t mean that you are not connected to the internet or you are having some connectivity issues. It is more like a web page only designed by the developers of the website and also consumes your data to be loaded in your web browser. Check: How To Install Fusion Kodi? Cause/Reason: Why 500 Internal Server Error (HTTP Error 500) occurs? It is clear by this time that if this error comes up, it means that there is something wrong in general itself. The word generally refers to a plethora of reasons such as bug in the programming of the web page you are trying to access, or its server has crashed down to overload, restarting the web server, the page had been shifted to another location temporarily or for good, there are some configuration issues and list goes on and on.. In fact, often more information is provided with the error message by giving in two more digits after the number 500 in the case of some of the websites if they are running Microsoft IIS software. 500.22 An ASP.NET HTTP modules configuration does not apply in Managed Pipeline mode. 500.23 An ASP.NET HTTP handlers configuration does not apply in Managed Pipeline mode. You can further get the information regarding this IIS-specific codes on Microsoft’s The HTTP status code in IIS 7.0, IIS 7.5, and IIS 8.0 page. See: YouTube to MP3 apps. How to Solve the 500 Internal Server Error? So, the next question is surely how to get rid of this thing? What can you do to fix it? Actually, nothing. Yes as said earlier 500 Server Error is something out of normal on the server side and everything is An OK on your system. The best possible way is to wait for some time and visit the site again after some time. This is the first line of action in any crisis over the net. If you have got luck on your side, this simple click of the Refresh/Reload button will do the magic. You can also simply press F5 to get it done or write the whole URL again in the address bar. If it works out then it means that the webpage was having problems the first time you loaded it. And the guys at the other end have fixed it for your next trial. Here one more thing is to be noted is that you are not to try this stunt if you get the error while carrying out an online merchant transaction. Doing so may send the request for payment again to the source and you may end up paying more than once. Related: Windows 10 Start Menu Not Working. Even though this thing may seem silly in the case of Server errors, it is worth a try. There may be chances that the webpage got a little revamped after your last visit. And your browser is trying to get the stored data from the last visit which conflicts with the newbies. So clearing it up may force your browser to load the whole page again and the problem may be solved. After clearing the cache, restart the browser and try again. Some 500 Internal Server Error issues can be solved by deleting the cookies associated with the site you’re getting the error on. After removing the cookie(s), restart the browser and try again. Sometimes it may happen that the true problem is due to Gateway Timeout issue and developers have just got it wrong. So one can also try the solutions of this type of error. You can Google what to do in case of 504 Gateway Error. This is another option to try out. It may so happen that the maintenance guys have got no idea of the issue and if you are in immediate need of the service, you can go for it. Google for Website Contact Information or look for the contact information of the organization itself and let them know about the issue and request to get it rectified ASAP. Also: YouTube to MP3 Online. If any of the above solutions doesn’t fix the issue, then it’s already a problem out of your control. It will eventually be fixed by someone else. If you are a developer! Till now, we have been saying that it’s not the users’ problem if they encounter a 500 error. But what if it is! I mean what if you are on the other side of the sword. That you are a developer and you are getting the same issue with your own website. In that case, we will need a more technical approach our here to get it solved. A Permissions Error: In many of the cases, it is seen that a 500Internal Server Error is due to an incorrect permission on one or more files or folders. In those cases, PHP and CGI script’s incorrect permission the usual problem. These should usually be set at 0775 (-rwxr-xr-x). A PHP Timeout: If the scripts are working and connecting to the external resources, but those resources timeout, then again an HTTP 500 error occurs. In this case, timeout rules or better error handling may resolve the issue. A Coding Error in .htaccess: It may be possible that you haven’t configured/structured the .htaccess file of your site. Syntax or coding error in cgi/perl script: If .cgi or .pl is producing the error in a web page, then you should check the script for errors. New Plugin/Theme/Software Installed or Updated: If this is the case, then you need to roll back and check if it solves the problem. Server timeout: If the server was busy or needed to be restarted, it may have lost the connect. Restarting doesn’t solve the issue completely. It will be down again when it’s accessed by more users. You should contact your hosting provider or contact a developer. Increase php memory limit in wordpress may solve the issue. If it’s a wordpress site, then some faulty plugin may be causing the issue, 500 Internal Server Error (HTTP Error 500). But if you are not a developer and are just another user who uses an off-the-shelf content management tool like WordPress, Joomla, etc. it’s always advisable that you contact them with your issue. There are more browser error messages similar to 500 Internal Server Error. Other server side errors similar to it are 502 Bad Gateway, 503 Service Unavailable, and 504 Gateway Timeout. Client side HTTP status codes are like the popular 404 Not Found error, etc. The complete HTTP status error code list is here. Stay tuned to TheReporterTimes for more tech solutions and fixes.